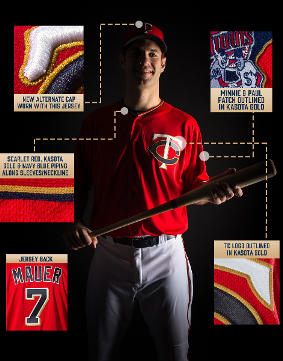 The Twins on Thursday unveiled new red alternate home jerseys — just in time for TwinsFest, which begins Friday at Target Field. They will be available for purchase at the clubhouse store. They feature a red cap and red jersey top, both with simple “TC” logos on them. They introduced in 2010 alternate home jerseys with pinstripes, blue caps and blue lettering — so clearly these are much different. @Twins @TwinsPrez Stop. These are awful. Creams and white pinstripes only. Ragnar to the Bears? How much does a mascot make? RandBall: Tom Brady's son wearing a Gophers sweatshirt. Class of 2026?